Finding somewhere to stay with dogs – particularly if they’re big, you have more than one, or other important requirements, isn’t easy. Finding somewhere truly great is even harder. We have spent ten years holidaying in the UK with two Gordon Setters – now, we’re travelling with one elderly, slightly arthritic, blind and diabetic Gordon, so we can report back on how hotels deal with virtually every requirement a dog owner might have. So what better to do than start a series of reviews of dog-friendly hotels? Here you will get the low-down on the best places, the best rooms, and tips to make your stay great. And if you have a review you’d like to add, just contact me. Together we can make the country a better place for dog lovers to holiday in. To start the ball rolling, here is a review of the Cricketer’s Arms, Rickling Green, Essex, where we stayed recently. This describes itself on its website (www.thecricketersarmsricklinggreen.co.uk) as a ‘country pub with rooms’ and the website rightly describes the village as tranquil. The pub itself is a handsome red and white brick building of some considerable age (looks like a mix of Victorian and Georgian to me) that faces onto a truly beautiful village green where cricket is still played. 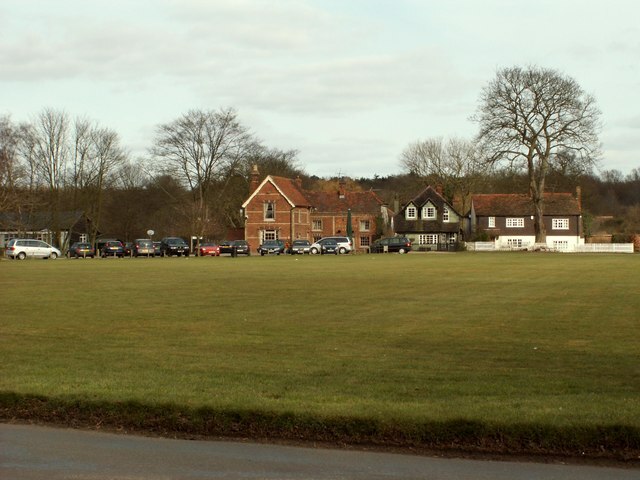 It’s a great place for that early morning trip out with the dog(s) while you’re still half asleep, as the pub car park is directly next to the grass, so there’s no busy traffic to dodge. The website also describes the menus as ‘thoughtfully created and changed often’. The food is very good although in terms of ‘changed often’, we were there just as their ‘spring menu’ was about to change to the ‘summer menu’ and I’d argue that if that means there’s a menu change for every season, that’s not exactly ‘often’. Certainly in the three nights we stayed, the menu remained the same. The specials board was the same for two nights though Wednesday was ‘steak night’ – the steaks looked good, but were very expensive. Having said that, the chef is clearly very good – a ploughman’s platter turned up a home-made Scotch egg which was truly wonderful, and the fish platter was mouthwatering. They also do a mean burger, and I enjoyed the mushroom risotto very much. Portions are generous and you’re able to keep your dogs by your side if you dine in the tiled areas, which is unusual and much appreciated. Having said all this, I have to deal with the accommodation, which we booked via their own website. The pub’s prices start from £69 for single occupancy, from £79 for a standard double (all prices per night), the junior suite is from £95 and the ‘Lord’s Suite’ from £125. There’s a levy that starts at £10 extra for Friday and Saturday nights. The pub’s part of the ‘Cozy Pubs’ group which includes two other hotels, the Eight Bells in Saffron Walden and the Saracen’s Head in Great Dunmow. If you look at the Cricketer’s Arms website the rooms look fabulous. Certainly the junior suite looked fabulous and as we got a good deal, we were looking forward to our stay. With a large, partially-disabled dog the extra room would be needed and very welcome. When we arrived, I was shown to a very small room by a smiling chap and left to my own devices – to wonder, basically, if the bed had eaten the suite. No explanation was given, so I went to break the news to my other half, who was looking after Lexie while I did the forward scouting. He came to view the room and we both agreed it couldn’t possibly be the suite we’d booked, so he was duly sent to tell the smiling chap there had been a mistake. The conversation, as reported to me, went something like this. ‘It’s what you booked’… Hubby at this point showed him the booking form which (fortunately) he had printed out and which confirmed we’d booked the suite. At which point he came back to report to me, and the chap came running out after him to say we could have the suite. A miracle, you may say. We scraped up our bags and moved to the new room, which was a lot bigger. I have a shrewd suspicion it wasn’t the suite, partly because it looks nothing like the photo of the suite on their website (it didn’t have a separate sitting room, which is sort of how I’d define a suite). Anyhow, the room was fine, it had a settee and very nice furnishings, and it suited us much better. At least the poor dog could lie out fully. Being upstairs was unfortunately a bit of a problem as the stairs are hard-edged and have narrow treads – for a blind dog, they weren’t good. Fortunately Lexie’s an enterprising girl and neat on her feet, so one trip up and down and she had it figured out, but it wasn’t ideal. The best I can suggest for other dog owners is to actually ring up and fully discuss your needs with this hotel beforehand, to avoid problems. I have to add that the bathroom shown on the website also didn’t represent what I saw in either of the two rooms we were in. I have no idea about the other eight rooms, but both of those had very basic white tiled facilities, plain and municipal in feel. The bigger room had a very cramped toilet cubicle – I suspect some room has been carved off it to create a niche in the next bedroom, but it means you’re constantly fighting the toilet roll holder to sit down. The shower itself was a nice modern one and easy to use with a welcome ‘boost’ function, but the effect was slightly spoiled by the fact that the small shower tray was badly chipped and the shower curtain far too long for the cubicle, so it wound round your feet while showering – and was also discoloured and slightly mouldy, which I wouldn’t call ideal. The cleaning also left something to be desired – I think one day we were given a new towel, but as far as I could see the room wasn’t cleaned while we were there (having a black dog, hairballs on a pale carpet are a dead giveaway). I made the bed roughly, and it was not, to my eye, re-made. I don’t know what would have happened had I left it more untidy – one hopes someone might have helped out! That is more or less it, for this report. The staff are friendly but they don’t seem to be able to deal with any problems relating to the room bill – we overheard them distancing themselves from this process again with another customer. If you have a query about the room charges, they clearly expect you to take it up with your ‘agent’ – though who this might be if you book through their own website I cannot imagine. This image was taken from the Geograph project collection. See this photograph’s page on the Geograph website for the photographer’s contact details. The copyright on this image is owned by Robert Edwards and is licensed for reuse under the Creative Commons Attribution-ShareAlike 2.0 license.